Hubbard Fellowship Blog – Tumbleweed Dystopia! I took a three-day weekend to go camping in Cimarron and Comanche grasslands, where Oklahoma, Kansas, and Colorado all meet. Historically, this area was dustbowl central. The federal grasslands originate in the real estate bought up by the government during the depression, when it became clear that this area was not suited to heavy-tillage farming. The roads were marked by abandoned houses, and the region is rather remote. Remote is part of what I look for in a good camping destination. After following frustrating directions that led me down several rough dirt roads and up some rancher’s driveway, I backtracked and pulled over in Campo, Colorado for breakfast and better instructions. Campo has a post office, a church, and the homey Campo Café. The locals were finishing their Saturday morning breakfast and trying to round up help for the various chores they had on their agenda. The all wanted help ‘burning weeds’. I learned the significance of this preoccupation later. When I asked directions to Picture Canyon, everyone to a man had been there. One said it was a “really special place”, and he seemed tickled I had come so far to visit a piece of land in his backyard. The man was right. 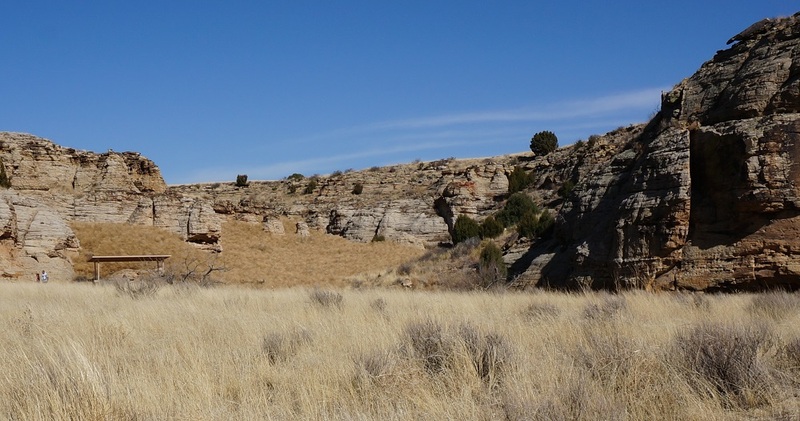 Picture Canyon, in Comanche National Grassland, is a special place. 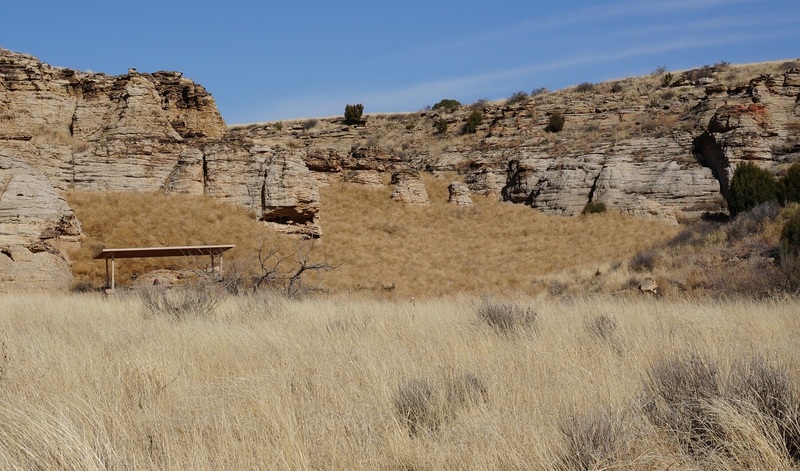 It has been a refuge to Apache and Comanche, and it features pictographs, ruins of abandoned homesteads, and a natural arch. Unfortunately for me, the trails were so lightly used and haphazardly marked I was unable to find any of them. After spending hours with the entirety of my mental faculties fixed on path-finding, I decided to call it quits when I took out my compass and it split into three pieces- a bad omen if ever I saw one. Nevertheless, I was smitten by the rocks and flora of this semi-arid prairie. I recognized yucca, cholla, rabbit brush, blue grama, buffalo grass, prairie coneflower, scarlet globemallow, a milkweed species, and sand dropseed. I also saw withered prickly pear (from the rough winter? ), and devil’s claw, a native plant in the sesame family eaten like okra. The soils were sandy and loose. My general impression of the place is that it rides the border between prairie and desert. However, what really struck me were the tumbleweeds. Devilsclaw- A very cool native edible. You can buy seeds from specialty stores. The tumbleweeds shifted with alarming rapidity and scurried like animals. A path that had been clear in the morning was blocked, taller than a person’s head, by the afternoon. A forty foot canyon was packed to the brim. I included a picture, with a picnicker for scale. I see why the farmers were so intent on burning their weeds. I could only think “Someone, give me a drip torch! I’ll solve that tumbleweed problem.” when blocked from exploring side canyons by their packed mass. Though tempting, lighting a fire in a box canyon under 35 mph gusts is probably not an ideal solution. Tumbleweeds- I wasn’t kidding about the 40 ft canyon full up with tumbleweeds. See the person leaving the picnic area? She said the weeds rolled like a wave with every gust. A closer look at the canyon. Tumbleweeds (Salsola tragus) were accidentally introduced to South Dakota via contaminated flax seed from Russia in the 1870s (from Flora of North America). From there the weed spread throughout the United States. Tumbleweeds have an irritatingly efficient method of dispersal. They’re annuals, and after they dry at the end of the season their stem snaps, allowing them to ‘tumble’ across the landscape. They litter the earth with seeds at every bounce. No animals are needed to spread this pest. This has been a banner year for tumbleweeds. Tumbleweeds thrive on the disturbance in the wake of fires and drought, and they themselves are a fire hazard. Their populations are so bad that in Colorado and New Mexico there are reports of people trapped in their homes by tumbleweeds piled up against their doors. The tumbleweed plague has garnered major news coverage and special task forces in stricken regions. The other campers and I all gathered in the evening to discuss the shocking abundance of tumbleweeds. When I told them that it hadn’t been a problem in Nebraska, they were curious. I think part of the reason Nebraska escaped this pestilence is because it is wetter here and more heavily cultivated. More moisture seems to allow the native vegetation to compete better on fallow lands, and intensive farming doesn’t allow the weeds a place to grow in areas under cultivation. Unfortunately for Colorado’s ranchers, drought and open space has given the tumbleweed an edge. Hidden shelter- can you spot my tent? 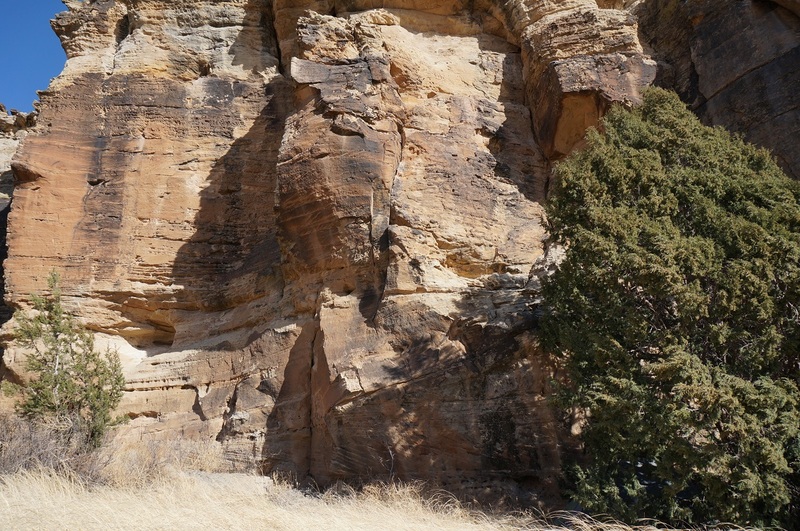 Between the cedar and the canyon wall is the only place it would stay terrestrial with the gusty winds. On the drive back through eastern Colorado I appreciated the wildlife I saw, still seemingly thriving in the face of this unusual boom. Colorado’s high plains are a hunter’s paradise- I saw abundant pronghorn antelope and muledeer, and I counted 9 pheasants in the troughs alongside the highway (a behavior that has earned them the sobriquet ‘ditch-parrot’, which I adore). Lastly, I met and fell in love with a german shorthaired pointer pup, whom I intend to adopt at the end of April (if everything goes according to plan). So, I learned more about current and past crises in my grassland home, and I picked up a new family member along the way. Not bad for a long weekend. This entry was posted in Prairie Natural History, Prairie Photography and tagged campo colorado, cimarron grasslands, colorado, comanche grasslands, hubbard fellowship, salsola, tumbleweed by Chris Helzer. Bookmark the permalink. Anne,absolutely loved this post. Reminded me of the days that I went solitary camping to get away from it all in the Texas panhandle while attending WTSU. My favorite out of the way spot was Palo Duro Canyon. There were places in there that you could avoid anyone else and see tons of wildlife. Favorites were the Muledeer and Golden Eagles. I certainly miss those days. Keep it up! You make me proud to know that there will be other women out there walking the land and caring for it. Thanks Becky! My post-fellowship position is in Texas, and Palo Duro Canyon is high on my list of destinations. I’m glad to hear it doesn’t disappoint. 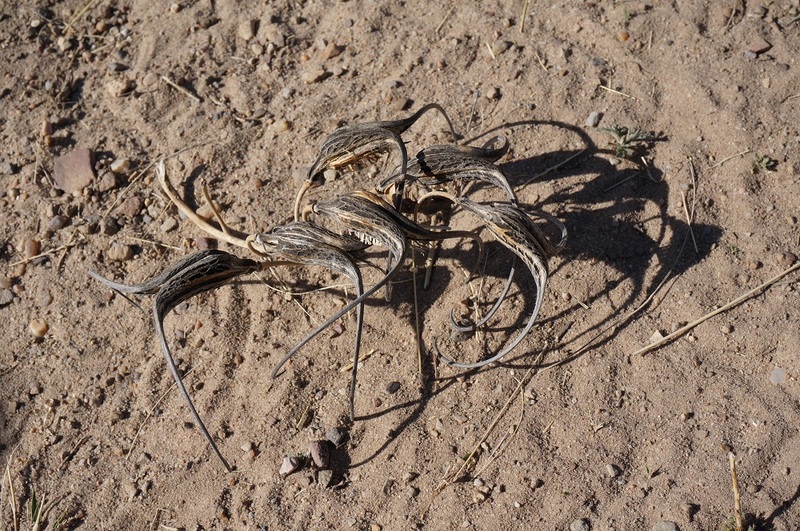 I’d heard about devil’s claw being used for basket making, but I suppose I can imagine an elf hat out of the seed pods. How cool to have roots in the area! I loved how open it was. You really could see unobstructed all the way to the horizon. Actually people make elves — with costumes and everything — out of the pods. You’d have to see one to believe it. Two pods are combined, as I recall, with one forming the legs. People are so creative. My family roots are actually in western Oklahoma, not the Cimarron and Comanche Grasslands area, though I have friends from that area. The breaks along the South Canadian are all red clay and caliche and gyp rock — and tumbleweeds! One commonality with SE Colorado is the dust blowing everywhere on windy days. We pretty much gave up trying to farm there after a couple of generations and left for city life. A college education has been the ticket to escaping rural poverty for millions. Thanks for the vivid essay. The beginning of your post reminded me of the “Lonesome Dove” books by Larry Mcmurtry. The end reminded me of a short story I came across while reading “The Best American Short Stories of the Century” by John Updike and Katrina Kenison. I had been reading short stories from this collection to past the time this long winter. The story that reminded me of your post is on pp. 224-240 and is titled “The Peach Stone” by Paul Horgan. It is a sad story but is worth reading for its quality writing. Thank you, James- that is quite a compliment! I’m glad you enjoyed the essay. Chris, great photos and this place sounds great. Also you will love the puppy – growing up we had a German Shorthair – great dog and great hunting dog. I’m jealous. Maybe when I retire . . . I loved going along in my mind to a place where I’ve never had the chance to spend any time other than passing through. I must make that right some day. have a great stint in Texas. (Notwithstanding a certain reputation…) It really is a wonderful state with some wonderful nature. Thank you James! I’ve really enjoyed writing these posts, and I’m searching for a way to keep writing after the fellowship. I’m sure I’ll figure something out. Anne- Did you see any Mountain Plover when you were there? We are planning on conducting nesting surveys in that area for FWS this year. I didn’t see any plover this trip, but I wasn’t there very long and I wasn’t looking. Hope you find some! Where in Texas will you be? I’d highly recommend you make a trip to the Trans-Pecos, Mountains and Basins Region – the only area in the state with true mountains. And there’s lots of Tumbleweed in the old farming communities and any grasslands that are overgrazed or improperly used. If you do head this way, contact me on my blog healthylandethic.com and I can show you around on our Texas Native Seeds Project – a different restoration model than what you did in NE. Texas is a big state and there is so much to see. Hope you enjoy your next job! Thanks for the recommendation Jameson! I imagine I won’t have to struggle too hard to find some tumbleweed in Texas, should I happen to miss it. I’ll be based in Fort Worth. I look forward to meeting the prairie enthusiasts down in that neck of the woods when I move there in a few weeks.